So tell me, how was your Thanksgiving weekend? Did you eat a lot of food? Are you feeling a little bit sick right now? Need something light and healthy for dinner? Yeah, me too. As I mentioned on Friday, our Thanksgiving dinner consisted of some semi-Thanksgivingish things from Whole Foods (twice baked potatoes? Why not! ), so we just got enough for one meal and we didn’t have any leftovers. I was feeling pretty good about not having days worth of mashed potatoes or pie in the fridge, but then I made brownies. Sugary, buttery super rich Mexican chocolate brownies. Ugh, you guys, no more brownies. Or sweet potatoes. Or stuffing. No! More! Can we just talk about salads and ice water this week? The good thing about holiday over-indulgence is that when it’s all over, I feel more motivated to eat healthy. There’s nothing like a night spent regretting eating that extra Thanksgiving brownie (and topping it with gelato–oh yeah, that happened) to help get you back on track, right? 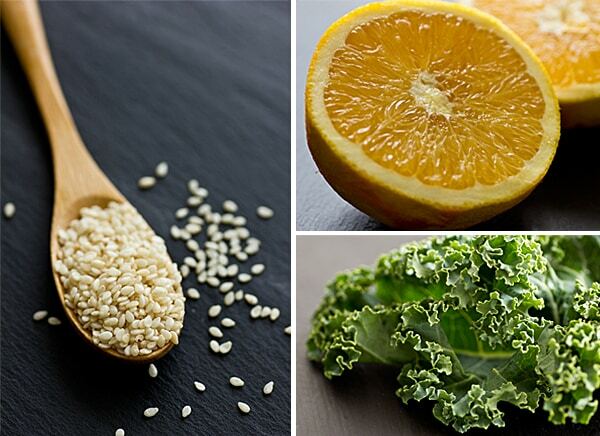 So here’s a recipe that’s light and healthy–Citrus Sesame Kale. And it’s also easy, because after Thanksgiving, I bet you don’t want to spend a lot of time cooking either. This serves 4 as a side dish, but you can add some baked tofu or marinated tempeh and it could easily serve two as a light main dish. Kale is definitely my favorite green. There are other greens that I eat because they’re healthy even though I don’t really like them (spinach, I’m looking at you), but kale is a green I will actually look forward to eating. Some people say kale is bitter, but I’ve never found that to be true. (I’m not saying they’re liars, but I think I might be missing a tastebud or something.) To me, it’s earthy and chewy and delightful. Yes, delightful! There’s nothing creamy in here. Nothing rich. It’s just what you need when you’ve got a post-holiday food hangover. 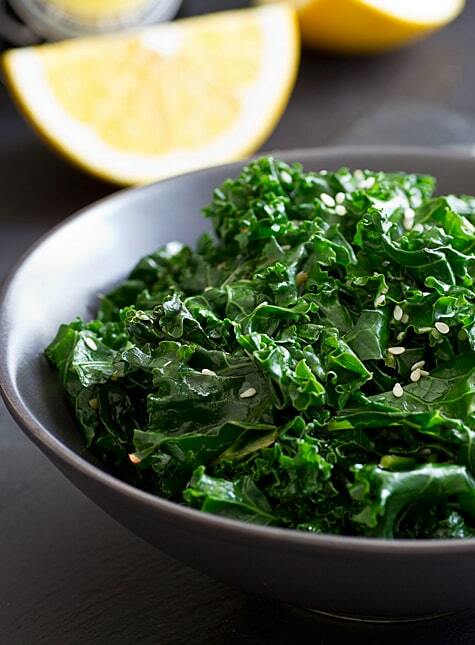 A light, easy Asian-inspired side dish made with kale, fresh orange juice, and sesame seeds. Heat sesame oil in a large skillet or wok over medium heat. Add ginger and garlic; cook for 30 seconds, or until fragrant, stirring constantly. Add kale and stir until coated with oil. Stir in soy sauce and orange juice; cover and cook for 3 minutes, or until kale is softened. Stir in sesame seeds and red pepper flakes (if using) and serve. You just described my feelings on kale exactly. This looks delicious! I look forward to eating kale too…although I’ve never eaten it just on its own as a cooked side dish. This recipe definitely sounds like it could stand on its own though – I love all the flavours going on! Your pictures are gorgeous! Who knew kale was so pretty?! Even without post-Thanksgiving blahs, this looks appealing! Love that there’s orange juice in it to brighten up the flavours, I’ve never thought of that combo before! I’ve never had raw kale, so I’ll have to try. Ok, I’ll admit, I only had cooked kale once years ago. Time for another taste. And I do like spinach! I switched between my macro and my 50mm f/1.4 for this set. But the big change I made was shooting directly into the light (usually I shoot diagonally into it because I didn’t want to move the dining room table). I always feel like my photos are a little dull and WOW did changing my position make a difference. Salad and ice water sounds pretty good right about now…that is until the all the holiday goodies start calling my name! This looks delicious! I am always looking for new and exciting kale recipes! I have a confession to make: I’ve never eaten Kale. Never…even though I get it in my organic produce delivery every single week…it always sits in the fridge until I throw it away. Maybe I will try this recipe! I’ve bought kale exactly once before but this sounds like something I might have to try again. I have a hard time selling my husband on new things – he’s mostly planted in his meat and potatoes Midwestern roots. Well, I think of all the greens that are out there, kale is the easiest to like. There are a lot that are really bitter, but kale is much more mild. I just found kale this weekend! For the first time ever! I love how green yours look. It looks so light and nutritious! Thanks for sharing this delightful recipe. We grow 6 types of kale in our backyard from October through March. When the warm weather comes, however, kale may begin to have a slightly bitter taste. 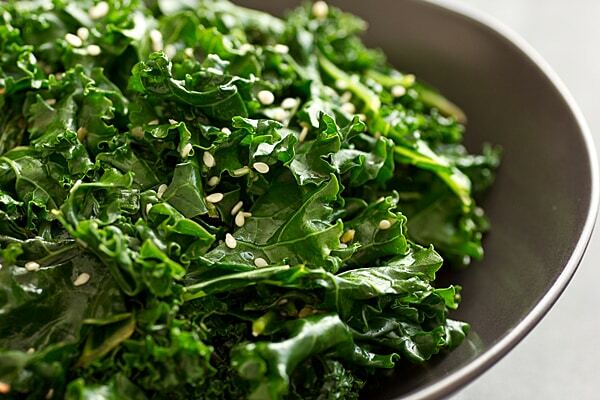 The cold weather is when kale is at it’s tastiest as the chill brings out kale’s natural sweetness. Yes, kale is definitely best in the colder months of the year!